Theater is a sixteen-foot to scale portrait of my kitchen. 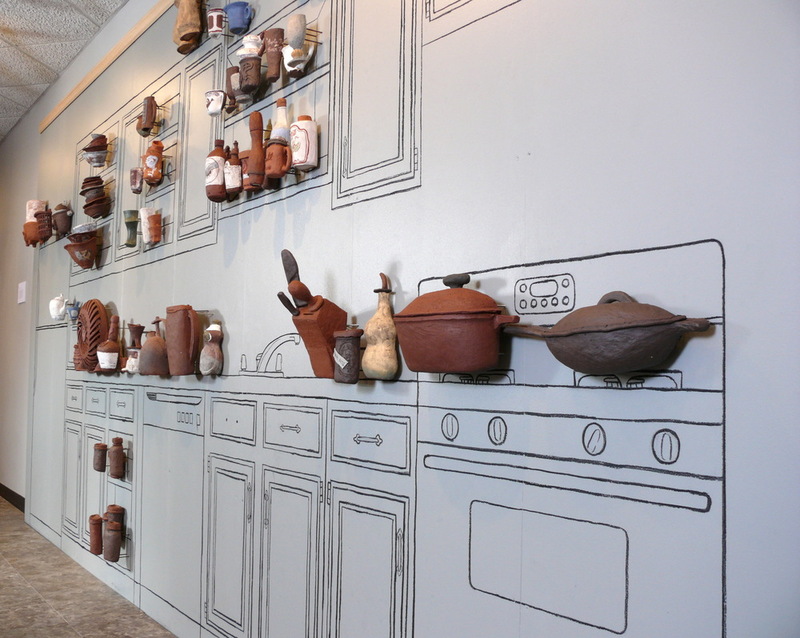 This installation is comprised of flat-backed terracotta versions of the objects in my kitchen suspended away from the wall, but oriented inside and on top the stove, refrigerator, and cabinets drawn on the wall in charcoal. The flat-backed clay objects are direct portraits: a Cuisinart ice cream maker; countless thriftstore mugs and glasses; a Lodge 12”cast iron skillet, a mason jar of bacon fat and a fan to try to cool the kitchen in summer. They are quick translations of the kind of real things we all use to serve, cook, display in our own homes. The kitchen is the heart of the American home, the centerpiece of the domestic public display but also the intimate space of family. Its a place where work is done; work that has become less guarded, more public for company, and often a showcase for performing an increasingly rarefied and arcane action, home cooking. Every object tells a story about itself, and its owner. There are coded values in everything, and we unconsciously read and compile an understanding or profile of the owner of these things. A cabinet of mismatched or designer tableservice tell vastly different stories. Our lifestyle, economic status, hobbies and social priorities can all be understood instantly by visitors to the home. Theater is exhibitionist--emphasizing the sensation of snooping through a stranger’s cabinet to explore a coded self-portrait told through the narratives of everyday objects.